The new teaser is here and as expected, it's only a little over a minute. What does everything think? Like most teasers, you're always left wanting more, but it's cool to get a quick look at one of the new characters. The teaser made my day!!!!! I was really tired and upset this morning because it was a Monday, but when I checked the forum this morning and saw the teaser, I got all hyped and had to make sure I wasn't seeing a dream. I think I'm going to cry tears of joy once I get home today. I'm SUPER happy now that we finally got a teaser and a new poster!!! I love Sporky's character and how he's voiced by Tony Hale. Haha, I'm definitely hanging up the new poster when I get home in front of my desk. Overall, I ABSOLUTELY CAN'T WAIT for June, and I'm really looking forward to hear more news soon!!! We thought it was a decently funny good trailer! Animation +100 Points from 2010! Hoping that it wont be a Cash grab but i'm sure it won't since we trust pixar since 2015 to make real good stories not just for money. I believe this will be great and the marketting will surprise us either way. Still wish we can hear mr. potato head's new voice actor and hoping it's consistent like slinky's voice in TS3. I think it’s a great Trailer with a great music choice to go with it. Variety has some info that wasn’t mentioned here - the new character is a spork-turned-craft named Forky who is a reluctant toy voiced by Tony Hale. Variety also refers to this as a clip and a full trailer will debut before Ralph Breaks the Internet - so there is likely more. I am so happy right now!!! It's can't be explained by words, it made me that happy!!! I was also happy the teaser trailer didn't start of emotional but happy teaser, as we know the movie will be emotional. This is going to be a great movie and can't wait to see this movie in June of 2019. I was wondering what people were also thinking about the poster that was released along with the trailer? 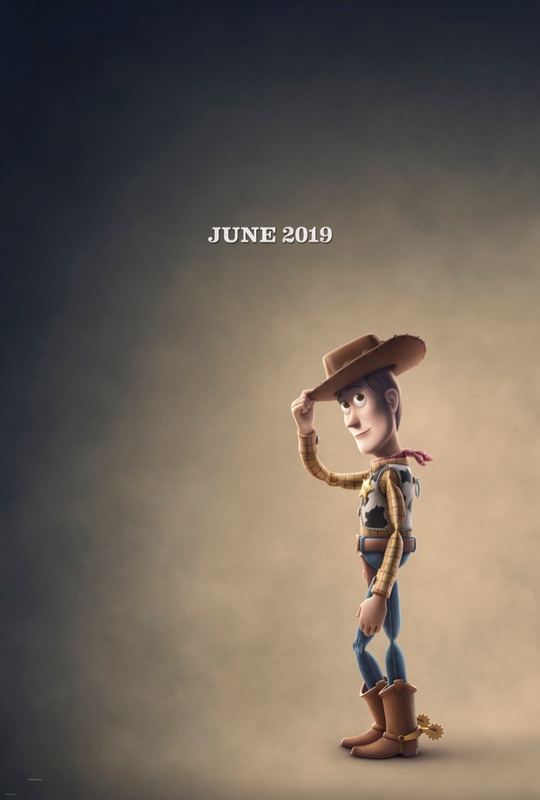 Does this mean that Woody is tipping his hat to say goodbye? Is this the emotional ending Tim and Tom were talking about? Also, agreed, another trailer (longer one) will probably be coming shortly. Are you guys going to do a teaser review of teaser trailer and if you do let me know when. When I look at this poster you can see that something big is going to happen in the movie. It's very sad, smokey, and emotional poster. The music choice surprised me, it was a nice fit, loved it. The animation on the characters doesn't seem to have gotten better than Toy Story 3 although we can't really expect it to, they look awesome in that film. The Concept of the trailer kinda flatlined for me. I get that they probably don't have much to show at this point, but I thought it could've been a more creative toolkit animation. Either way, nice seeing you guys again. Beautiful teaser poster, it's simple, it's nice, it's like Woody is giving you a welcome back to his world and the background hints at a bittersweet story. I'm here for that. We'll do a trailer review, but there is supposed to be another one coming really soon (and other info), so we're going to hold for that one since it will have more to it! Here's The 2nd Teaser Trailer Pixar Released with the 2 new Character Reveals Voiced By Keegan Michael Kay and Jordan Peele! Also Here's Our Reaction/Review to this Teaser Trailer! Hope ya Like it!